Now that Venus is finally gaining prominence in the evening sky, it will team with the moon (on April 17), the Pleiades (on April 24) and more, making for some eye-catching configurations. 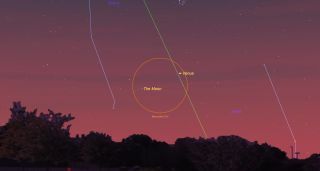 Low in the west-northwest sky, right after sundown on the evening of Tuesday, April 17, skywatchers will see a slender sliver of a crescent moon just two days past new phase, 5 percent illuminated. And situated about 6 degrees to the moon's upper right will be the bright and steady light of the planet Venus. On the evening of Wednesday, April 18 in the western evening sky, the crescent moon will traverse the constellation Taurus. The V-shaped face of the bull is formed by a large open star cluster known as the Hyades, one of the closest clusters to Earth. The moon will enter the "V" at about 8:30 p.m. local time and reach the midway point by the time it sets around 10:30 p.m. local time. A few hours later, observers in most of Uzbekistan and Kazakhstan, Central and Northern Russia, Northern and Eastern Scandinavia, Northern Greenland, and Northern Canada will witness the moon occult the bright, orange star Aldebaran, which sits at the southeastern corner of the bull's face. The following night, Wednesday, be sure to look for a very pretty sight, as a slightly wider crescent moon will appear to float near the bottom of the beautiful, V-shaped Hyades star cluster, marking the face of Taurus, the Bull. Initially, in the bright evening twilight, only the moon will be visible, but once the sky has become completely dark, soon after 9 p.m. your local time, the Hyades stars should be readily evident with the unaided eye. Interestingly, the bright orange, 1st-magnitude star Aldebaran, at the upper left of the V, is not part of the star cluster; it's just an innocent bystander. The Hyades are 140 light-years from us, but Aldebaran is much closer, at 67 light-years. Yet, by happenstance, it helps to form — along with the members of the Hyades cluster — an almost perfect letter V in our sky. Binoculars will greatly enhance the view, not only of the cluster's individual stars, but also of the phenomenon known as Earthshine: the waxing crescent moon appearing as a thin arc of yellowish-white light enclosing a ghostly, bluish-gray ball. For several nights up to nearly a week after the new moon, sunlight reflected from Earth will illuminate the nightside of the moon, making the satellite's entire disk visible. This is one of nature's most beautiful sights and recalls the old saying, "The old moon in the new moon's arms." Finally, on the following Tuesday (April 24), wait at least an hour after sunset to see the Pleiades star cluster — popularly known as the "Seven Sisters" — poised beautifully about 3 and one-half degrees to the upper right of Venus (binoculars will help).